﻿ Magical Alnwick Castle opens again Friday 29th March! 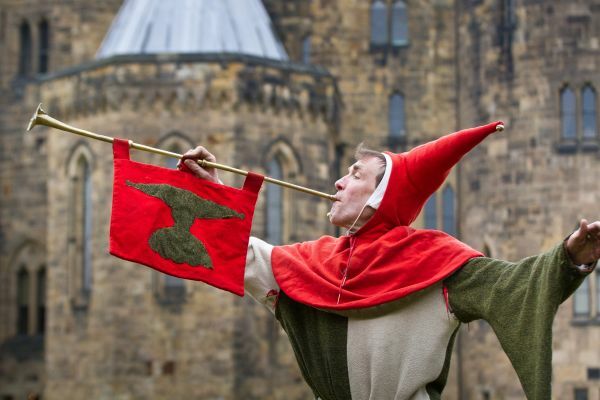 Home > News > Magical Alnwick Castle opens again Friday 29th March! Magical Alnwick Castle opens again Friday 29th March! This year you’ll find an amazing array of fabulous featured events and activities taking place every day until the end of October. Over 100 new, seasonal members of staff, including costumed guides, are already in post and are being carefully briefed, trained and tested in their new posts. Harry Potter is always alive and well at Alnwick Castle (the Castle starred as Hogwarts School of Witchcraft and Wizardry in two Harry Potter films) and this year is no exception. During various Wizarding Weeks and Wizard Weekends throughout 2019, you may see lookalike characters from the films, including Harry and Dumbledore, mingling with the crowds and conjuring up all sorts of fun. Alnwick Castle’s own wizarding professors will also be on hand and you might spot some real, live enchanted creatures (not for the faint-hearted) and make your very own magic wands in craft workshops. Due to popular demand there are lots more food outlets and visitors can now enjoy a much greater choice of tasty food, drink and snacks. There’s no chance of going hungry or thirsty during 2019 at Alnwick Castle. Over the winter the team has been very busy making big changes to the Courtyard café and restaurant, creating a new bar and creating a brand new Armoury Take-Away. Other evening activities include July outdoor performances by the popular Three Inch Fools, of Shakespeare’s Much Ado About Nothing in the grounds of Hulne Abbey and Shakespeare’s Macbeth in the grounds of Alnwick Castle. In August, Alnwick Castle’s “Cinema Under the Stars” will present screenings of Bohemian Rhapsody and The Greatest Showman. As usual, every day from 29th March until 27th October, you’ll find an amazing array of activities to enjoy, including the highly popular film location tours, broomstick training, and scary Dragons Quest (only for the very brave). Little children in particular - and sometimes grown-ups too - love the medieval dress-up, games and craft-making in Artisans Courtyard. Alnwick Castle is the one of the largest inhabited castles in England; it has been home to the Duke of Northumberland’s family, the Percys, for over 700 years. Combining magnificent medieval architecture with spectacular Italianate State Rooms, Alnwick Castle is one of the UK’s most significant heritage destinations. In recent years, it has taken starring roles in a number of film and television productions, most famously featuring as Hogwarts School of Witchcraft and Wizardry in the Harry Potter films and as Brancaster Castle in ITV’s Downton Abbey.